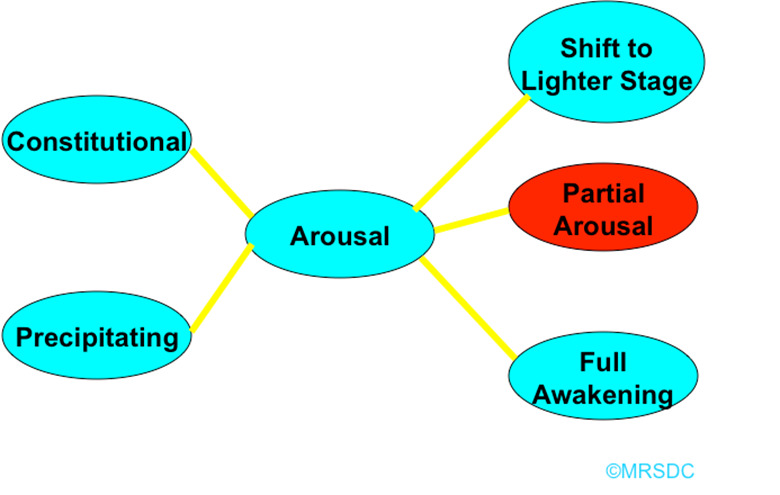 Confusional arousals (CA) are awakenings, usually from N3, marked by disorientation and amnesia with blunted affect, cognition, and behavior, but sometimes punctuated by violent or sexually aggressive behavior. 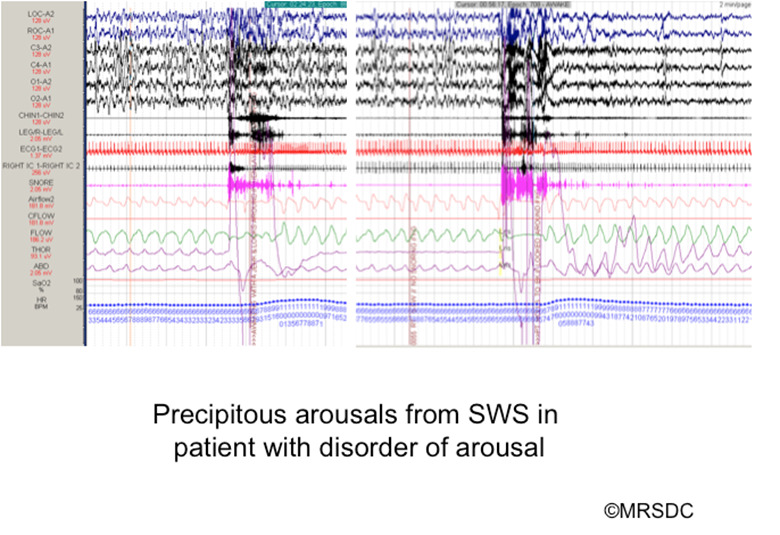 A PubMed Title/Abstract search of "confusional arousal" and "confusional arousals" (with no time restriction) only found 43 articles, suggesting there is muted research/clinical interest in this topic. Prevalence is estimated at 17% in children, declining to 6% in young adults, and continuing to decline to 1% in older adults. There is a strong genetic influence and environmental precipitants include abrupt awakening, irregular sleep schedule (e.g., shiftwork), obstructive sleep apnea, psychiatric disorder (e.g., bipolar disorder, anxiety, depression), alcohol abuse, and hypnotic use. Elevated CA, along with numerous other sleep disorders, are common to ADHD. It is not known how the risk of CA is distributed among the classes of hypnotics. 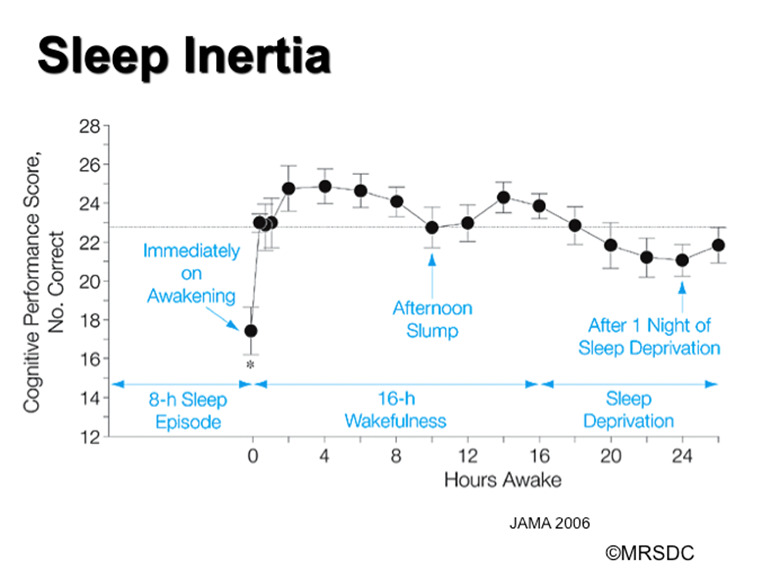 Confusional Arousal (CA), a phenomenon also referred to as sleep drunkenness, or, or excessive sleep inertia is a fairly common sleep disorder occurring in approximately three percent of the general population. CA is characterized by a period of mental confusion, including lack of judgment and spatial/temporal disorientation, which may occur upon nighttime or morning awakening from sleep or following a daytime nap. Individuals with sleep disorders, such as sleep apnea and insomnia, are more likely to experience CA, as are those with psychiatric illnesses and memory deficits (Ohayon, 2000). Medical illness and psychoactive prescription medications may also predispose to CA. While in the general population CA occurs most frequently in younger (< 35 yrs) individuals and those on shift and night work, its prevalence and associated risk factors within the older adult population is unclear. Many of the factors associated with CA occur with increasing prevalence in older adults suggesting that older adults may be at increasing risk for CA. Indeed, CA may itself be a risk factor for nighttime, and possibly post-nap, falls, a significant cause of morbidity and mortality in the older adult population. Parasomnias, including nightmares, poor sleep efficiency, and sleepwalking, are common symptoms of Post-Traumatic Stress Disorder (PTSD). The symptoms of PTSD as they will likely be defined in DSM-5 will be reviewed, along with the typical abnormalities in the two major stress responses systems in the body, the hypothalamic-pituitary-adrenal axis, and the sympathomedullary axis. Sleep is characterized by dominance of parasympathetic activity, so the adrenergic hyperarousal and abnormal cortisol levels typical of PTSD tend to disrupt it, triggering parasomnias. Treatments for them will be reviewed, including antidepressants and benzodiazepines. Promising evidence that prazosin, an alpha-1 adrenoreceptor antagonist, reduces nightmares and other PTSD-related parasomnias, will be presented. These treatments in the context of overall psychotherapeutic treatment for PTSD will be examined. Central Pattern Generators (CPGs) are present throughout the nervous system.Earliest movement patterns originate in the spinal cord. With maturation, come under control of brainstem pattern generators.Descending systems suppress spinal pattern generators. (Do they come out during sleep ? )The brainstem is capable of a wide variety of extremely complex behaviors in the absence of more rostral input.Decorticate experimental and barnyard animals are capable of performing very complex, integrated motor acts. State determination is the result of a large number of physiologic variables, which usually cycle in concert. The incomplete (combined) occurrence of, or rapid oscillation of, state - determining variables results in fascinating symptoms, which explain many unusual human experiences.The tonic and phasic components of the three physiologic states (W, NREM, REM) may become dissociated and recombined across states.